First of all, this will be the first time I've ever posted anything like this before. Usually I just draw these things up as more of a hobby. seeing as I cant for the life of me attach pictures off my PC directly to my post while posting in suggestions and ideas, for the sake of my sanity I've had to post this here (truly I am sorry) but without dwelling on it any further lets begin. Here is the list of suggestions in the order I have posted them. 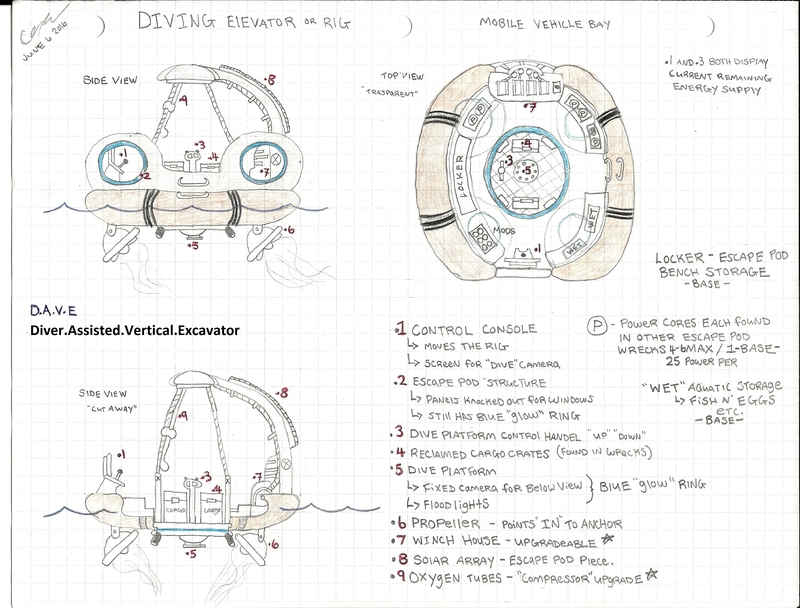 - D.A.V.E: A reclaimed life pod that now serves as a floating support vehicle. - Dive room: A "moonpool" style and a "pressurized style addition to the habitats, used for immediate surroundings exploration, plant harvesting and habitat building. - Cyclops docking module: A place to finally park the "big guy"
- Submersible maintenance bay: A new addition to the sea bases which allows modifications to the Cyclops submersible. 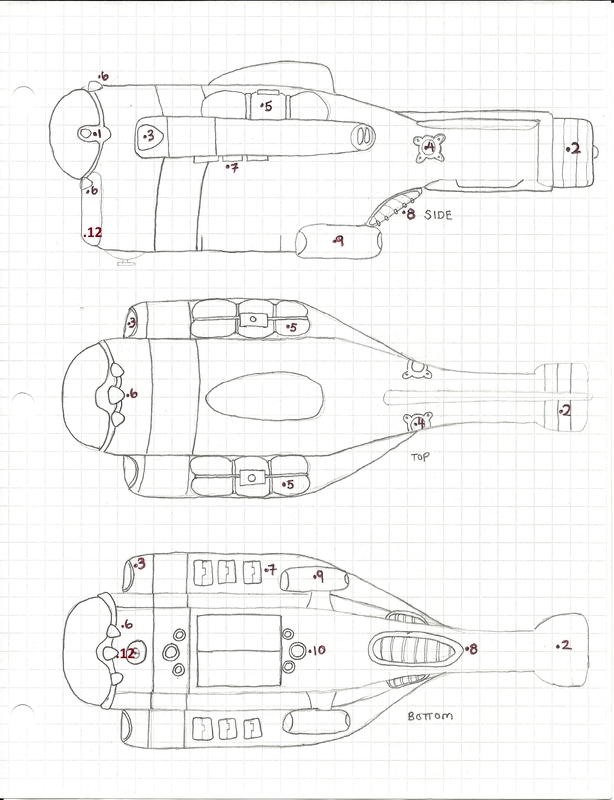 - More detailed view of the EAB's ( emergency air ballasts ) Seamoth changes, CDC ( Concussive depth charge ) and Specimen Containers. - While controlling the rig and elevator energy is consumed. 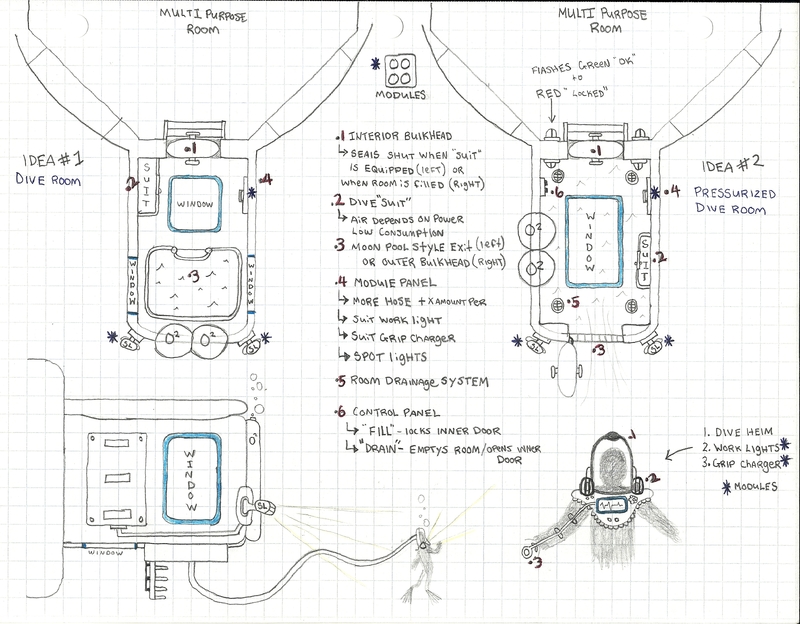 when power reaches zero Oxygen will no longer be pumped to the dive elevator. The lights can be toggled by the dive controls. - Although the elevator does move quickly it provides no protection from fauna or flora. 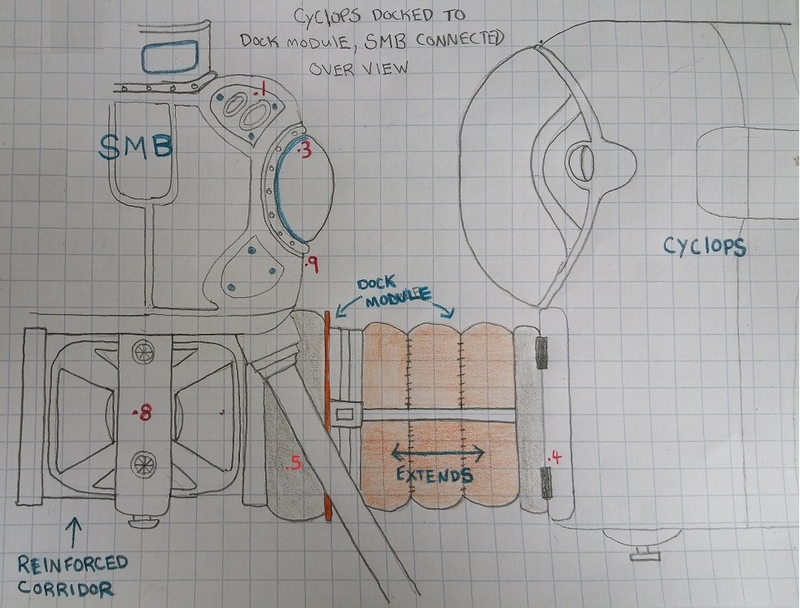 I just flipped through all my sketches and found the "Cyclops docking module" please forgive the quality as it was taken by my phone and not put through the scanner. The "Submersible maintenance bay" or SMB is built on an existing corridor. The corridors must have both sides reinforced (.4) before it can be built on the corridor. you access the SMB via ladder and once inside you can look out the left and right bay windows to see the fabrication arm bays. There is enough room to build multiple lockers and an existing fabricator (.3), to make previous materials easier to build on site. once selection has been made (.3) the doors to the fab arms spiral open (.2), the room floods with sea water and the arms spring to life. All of the outside modifications to the cyclops can be seen from the main viewing bubble located in front of the fab panel. Any internal cyclops modifications are on a time delay ( much like the building process of the cyclops ) just drop down the ladder and enter the cyclops to view. All cyclops upgrades (suggestions) are listed on the next post. These "Cyclops upgrades" are a culmination of others I have seen with my own personal touch added to them, Some upgrades are my own design. All of them are built by the SMB. Not all the upgrades have the materials factored in. 1. Manual spot light: once installed the lights go where the cameras go. they are toggled on and off while in camera mode. - kills smaller fauna, knocks out medium fauna (sand/bone sharks, amp eels, stalkers etc. 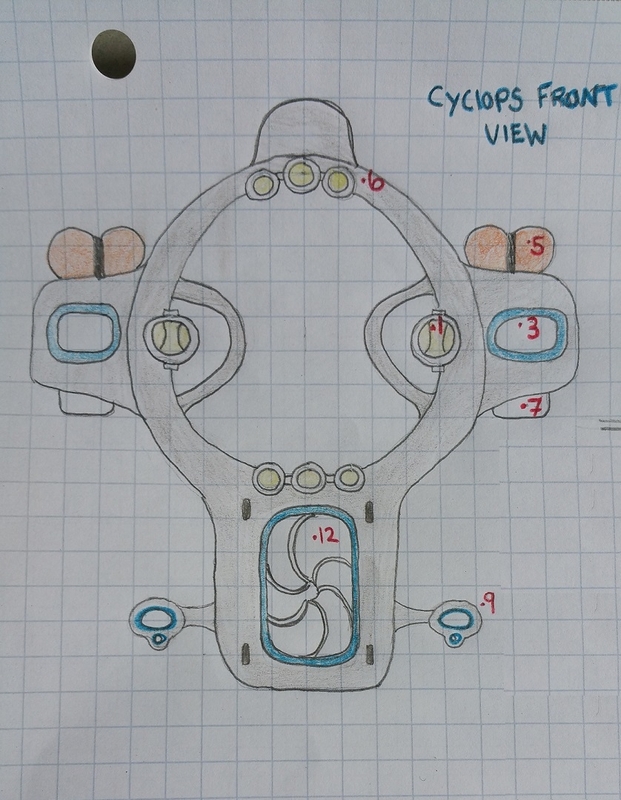 It was getting quite late when I first posted/wrote all this down, and I seemed to have missed the front view of the cyclops. Please forgive the quality of the picture, it was taken with my phones camera and not put through my scanner like the previous pics. Top left is the seamoth, i'm suggesting that the solar panel be removed from the modules list, in favour of building a physical one just behind the entrance hatch. it would function exactly like it did before, However you can also build the seamoths Emergency Air Ballast or EAB here as well, the choice is one or the other. by doing this we now have another module slot we can use, plus get back a little energy. 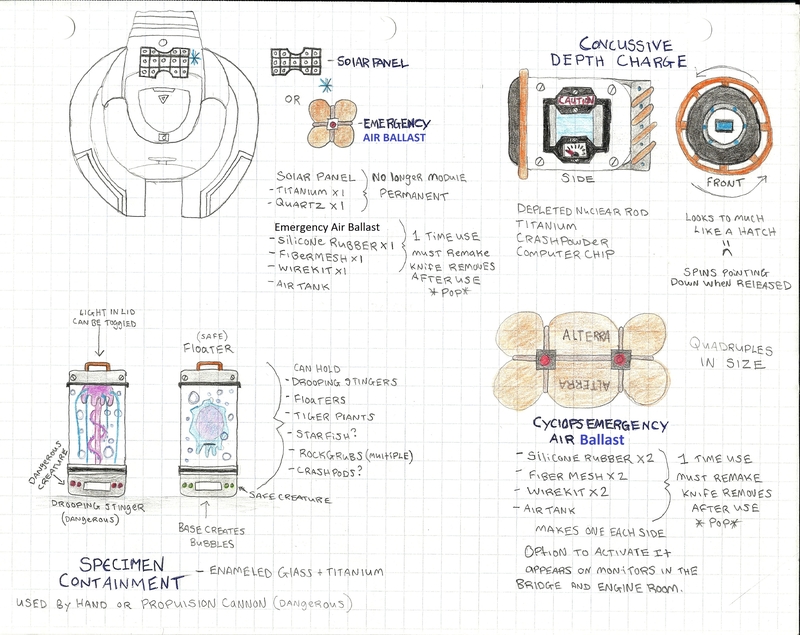 The bottom left is my Specimen containment canisters, Each tube is constructed from x1 enameled glass x1 titanium x1 computer chip. the idea behind this is right now we cannot safely add floaters to our huge aquariums (alien containment) so the only way to view them really is outside and depending on air supply very briefly. But then I got to thinking, wouldn't it amazing to be able to view some dangerous fauna/flora up close and safely with the optional ability to display them on a desk ( for scientific reasons of of course).. the dangerous fauna/flora include: Drooping stingers, Tiger plants and the Crash pods/Crash fish (ill explain) and the neutral fauna are: Floaters, Starfish (possible acquired off of Jellyshroom cave) and the Rock grubs ( those green "glow bugs"
Again I'm very sorry for posting this here, I'm a complete nard for not being able to figure out how to attach these pics on the other threads..
*EDIT* I cannot believe I forgot to mention this.. 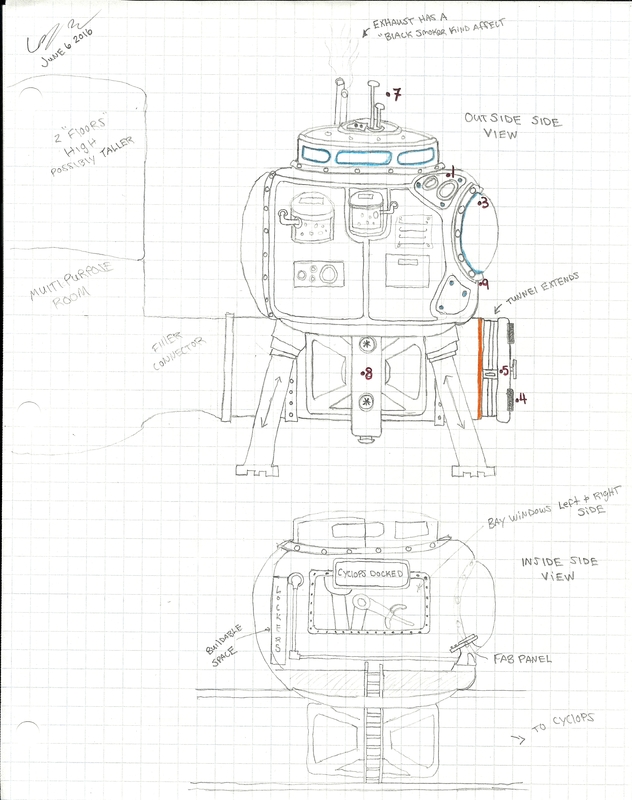 I also have a design in the making for what I've been calling the "seasphere", and so thing to allow quick transportation of items/materials across your seabase. Its either if you guys are interested or when I'm finished the complete draft for both of them I will update this post with them. Impressive work !! You have obviously spent a lot of time and effort on those ideas and drawings and that's just great. Congratulation! - D.A.V.E: just brilliant. I also feel that we need a tool to explore that is halfway between nothing (free diving) and the Seamoth, because I feel the Seamoth, as soon as it's done, makes us feel too safe, and while Subnautica is not meant to be a horror game, it should make you feel unsafe (who would not feel unsafe while swimming the middle of an alien ocean filled with gigantic alien creatures). So I can totally see myself using this and slowly descending into the abyss to mine stuff, while watching my surrounding. Great idea, wouldn't change a thing. - Dive room: Again, great idea for an entrance into the base, not sure about the helm though. I feel you will most likely install your base in safe environment, so you should have a good idea of what's around it. A dive helm for the Cyclops however would be very useful. As far as the entrance is concerned, I think a lot of us have an issue with the fact that we don't use a decompression chamber to access the base, which is unrealistic. A dive room entrance would solve that issue. - Submersible maintenance bay: also cool. We need to have the equivalent of the Moonpool for the cyclops anyway and your idea is a good one on that issue. 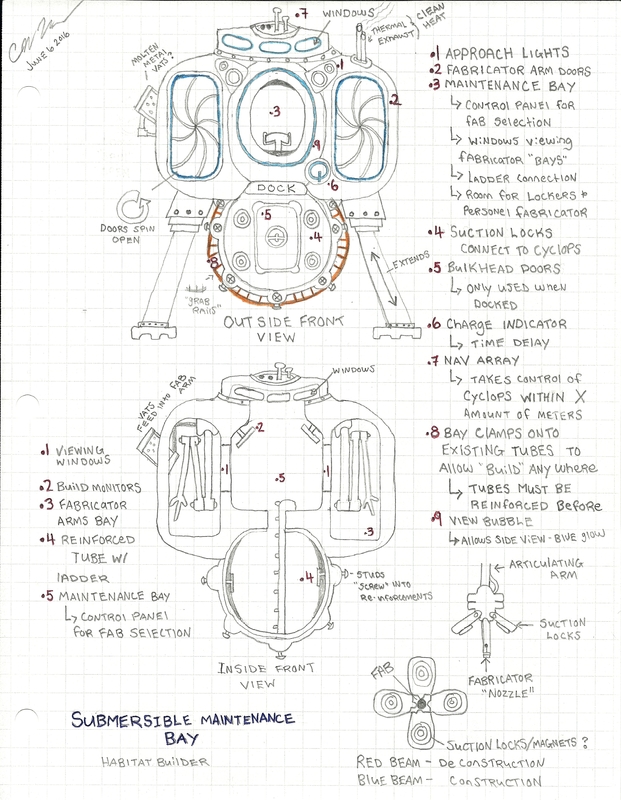 - Upgrades to the Cyclops: some ideas I love, like the Emergency Air Ballast, the Manual spot light, or the Thermal Charge Harness, while others feel less useful to me at the moment like the caterpillar drive since sound plays very little role in this game (as far as I know, creatures react to light but not sound). Would be cool if it was changed though. If sound attracted big predators, then a caterpillar drive would indeed become very useful. - Seamoth Upgrades: same as Cyclops basically. Great read overall. I doubt the Devs will have time to implement any of this before launch but they should definitely save it for a future update. @Coranth @Leon01 I appreciate it guys! @Osydius its taken me around 3 weeks give or take to go through all the renditions, starting from my first doodles of them lol. @Qelsar thanks aswell! I'm coming really late to the subnautica party! Only able to start playing it do to the Xbox one version!. Although having one of the designs in game would be amazing!, I'm trying not to hold my breath lol. I absolutely love the D.A.V.E Concept. it's an above-water vehicle that actually sounds useful. I see people posting about boats all the time and it doesn't feel neat or unique. D.A.V.E. However, is unique and has good functionality to it. I don't think a cyclops dry dock is ever going to happen. It would have to be so massive that it would be very difficult to place and still have enough room to maneuver your cyclops in to dock with it. I would much prefer we get a simple docking module that allows the front part of the cyclops to attach to a part of the base. 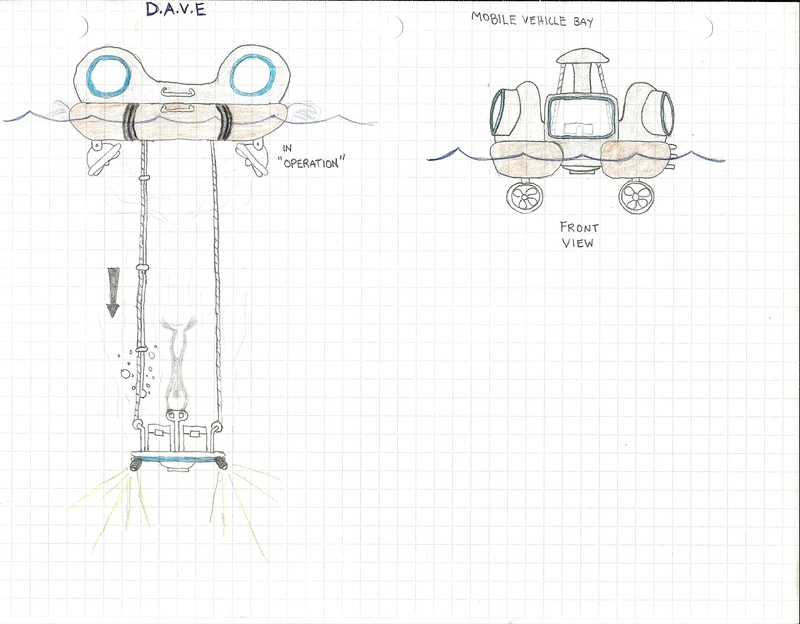 I like the idea for the DAVE though as it much more unique than just a boat and it has multiple purposes. I know that a dry dock for the Cyclops would be gargantuan that's why I didnt go there.. The SMB is another module all together that clamps onto the top of an existing reinforced corridor, but coincides with the Cyclops dock. the fabrication arms extend out from the SMB to work on the Cyclops. I hope this clarifies a bit more. It was getting late (early?) and my brain was going faster then my fingers. @joni65 thank you, One thing I really enjoy about subnautica is everything is balanced, There is no one thing to rule them all. So I really tried keeping to that spirit! Someone at least get the get the Devs to glance at his stuff... please! Yeah, but I was hoping to find the One Ring to rule them all. I thought I was getting close when I found the volcanos and smokers and stuff. Unless you heard a subnautican version of Gollum muttering MY PRECIOUS! , then yer not ''burning'' yet .... get it? And One for an Emperor, imprisoned and alone. And Subnautica to Bind them. Edit your post and re-quote this; I've changed it. @Rooks_Nemesis Wow just wow! For a first time posting your pictures you sure did it spectacularly! I have a question for you tho, does the cyclops bay thingy have any mod slots? Like a energy compensator? Thank you @Silver_Essence I was extremely nervous actually to post these! Once im done both which is hopefully soon ill just update this post!